A Place at the Table in Raleigh, N.C., is a restaurant with counter service that offers breakfast and lunch items like biscuits and gravy, quiche, panini, and salads. Menu items range from $5 to $10, and many can be customized for vegetarian, vegan, or gluten-free diets. 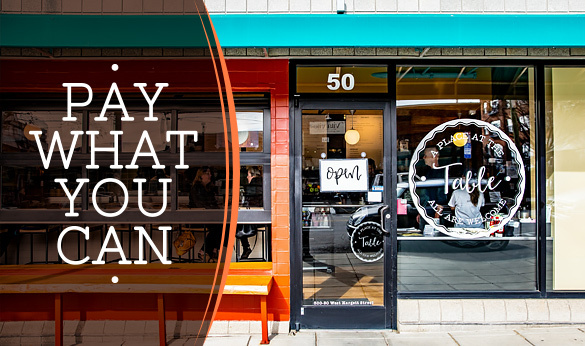 Though it gives the appearance of a pretty typical café, the diners are participating in the pay-what-you-can nonprofit restaurant model promoted by One World Everybody Eats (OWEE), the Salt Lake City-based foundation that has helped establish dozens of similar businesses across the United States. We spoke with A Place at the Table Founder and Executive Director Maggie Kane about the restaurant’s mission to make every person feel welcomed with a healthy and affordable meal. Pay only what you can afford, which might be less than the suggested menu price. Pay the suggested menu price like you would at any other restaurant. Pay more than the suggested menu price. Pay enough to cover the cost of someone else’s meal. Pay by volunteering to work at the restaurant. The number of volunteer meals available each day are tracked with a meal token system. Meal tokens are sold for $10 and, once purchased, may also be given to someone else, much like a gift card would be, or can be left at the restaurant for others to use as needed. Because each meal token is printed with the restaurant’s logo and address, anyone who receives a meal token will know where to go to enjoy a meal. Thanks to a year-long corporate sponsorship by Blue Cross and Blue Shield of North Carolina (BCBSNC), the restaurant will be able to guarantee at least 20 volunteer meals each day. Kane says the BCBSNC sponsorship has also helped others believe in the cause and make donations. A Place at the Table was in planning for 3 years prior to its January 2018 opening, but Kane first began to think about a nonprofit restaurant after college, while working with people experiencing homelessness. Although Kane recognizes how important soup kitchens are for underserved populations, she wanted to go a step further and offer those people the opportunity to enjoy a more typical restaurant experience, one that strengthens relationships and, in turn, the community. When she started researching nonprofit restaurants, Kane discovered F.A.R.M. Café in Boone, N.C., a pay-what-you-can restaurant that works with OWEE. The group does not offer financial assistance, but creates a network of like-minded entrepreneurs who are supported by each other and the OWEE foundation in other ways. The years-long process of creating A Place at the Table involved assembling a Board of Directors, holding fundraisers, filing for nonprofit status, hosting “Second Saturday brunches” pop-up events at different restaurants in the areas, and building a presence in the community and on social media. However, one of the most difficult parts of making the pay-what-you-can restaurant a reality was finding a landlord willing to support A Place at the Table’s mission. After finding the right storefront, it was transformed into A Place at the Table with the help of donated materials and professionals working pro bono. The team also grew to include a small table staff, a number of core volunteers, and a community advisory board that includes people who are or have been affected by poverty or who work directly with people experiencing poverty. Several members of the nonprofit restaurant’s team brought culinary and hospitality experience to the table, so it’s no surprise they were able to craft an appetizing menu. In fact, Kane believes it’s the good food that brings people back to A Place at the Table. Do you have questions about the positive impact a pay-what-you-can restaurant could have on your community? Maggie Kane encourages you to email her (maggie@tableraleigh.org) to learn more.